Hello there, this is the review about the popular squirrel buster wild bird feeder, for all of us that have a passion for bird feeding, but cannot get around little squirrels, this is one of the best squirrel proof bird feeder . As we all know, where there are birds, there is a little squirrel waiting behind a corner for that tasty seed that you are going to put out for the birds, squirrel needs to eat to right? Personally I think squirrels do need to eat, in winter even more, but feeding squirrels can cost you a lot of money. That’s why you can install a squirrel proof bird feeders, and most do a good job in defeating that clever little animal. Lets talk about how this bird feeders design works. When a squirrel jumps on the outer cage, it goes down, and in that way blockes the access to the seed port, the birds can have easy access to the food, but a squirrel is dumbfounded what just happened, and must walk away empty handed, and it works. I have seen squirrels trying again, and again, but at the end they failed. The feeder grids are made of metal, and squirrels cannot destroy them with their teeth, as they have done with a couple of my plastic feeders. Lets make it clear NO feeder is 100 percent squirrel proof, so some seed will be lost and there is no way around it, but the designs is very efective at what it designed to do. 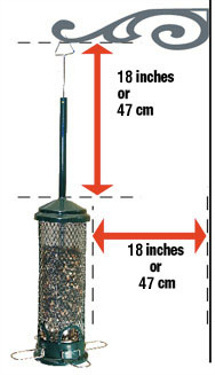 The squirrel buster states in the brochure how to hang the Brome Squirrel Buster feeder so that it is more difficult for them to access it, they specify at least 16-inches clearance, but it can be more, so squirrel cannot shake it, as they can try get the seeds to fall out to the ground. Hunger is going to make them do all kind of stuff, I am happy they cannot pick up a feeder and smash it. Is It Easy To Clean And Refill? I am happy to say these feeders are easy to use, and easy to clean, Classic and Finch models you just twist off on the top, then pour the seed, and it is ready to use. The feeders are very user friendly. The mini feeder is a little different, it is not as simple as the first two, you have to take the feeder apart, so in a way its going to take more time to pour in the seeds. In my opinion the feeder is going to get clogged buy larger seeds, so if you are using that one make sure to get small seed mixes, or you are going to spend time cleaning it a lot more, it gets frustrating after some time. You can wash and clean the components of the Squirrel Busters in warm water and some kind of dish detergent, you can use a little brush to get the dirt out from the corners. If you want white vinegar is a good disinfectant that will help you get the bacteria out from the feeder. One thing that is not good for the bird feeder components is to wash it in dishwasher, it can damage it from rolling inside and from hot temperatures. This review covers three of the Brome feeders, Classic , Mini, and Finch feeder, Not only do they live up to their promise of being squirrels resistant by their weight system, but the models realy are easy to clean and use. Also the feeder tubes are constructed with ventilation system. This system is designed to get humidity out of the tube, and to keeps seed fresh longer, it prevents mold to build up. Mold is dangerous to the birds and can harm them if not cleaned. The system appears to work, as I have not found problems with mold in my feeders, but also the seeds usually will not stay to long in the feeder if birds are around. Cleaning the feeder is important so you must do it from time to time, maybe once a week if you have time. The birds seem to like the feeder, the birds are all over them, Classic and Squirrel Buster Mini are attracting Tufted Titmice, Carolina Chickadees, Northern Cardinals, House Finches, and Sparrows are coming for a meal. Also, the weights on the feeders are calibrated so it shuts down at 4 ounces, which is unfortunately not enough to bar larger birds, like grackles. So from time to time grackles may be a problem, there is no way around it. Squirrels don’t like nyjer seed, so Finch feeder is a good option if you don’t like them jumping around and swinging on your feeder. The finch feeder holds 1.4 quarts of seed, so you don’t have to fill it as often, and I have to say that ventilation system is good, so the seeds are fresh for a long time. This is always a problem with this particular type of seed. The feeder is made to allow up to 6-7 finches to feed at the same time, it is made with four perches at the bottom, and a lot of space for clinging. It is a great spectacle for the eyes to see them jumping around and fighting for the food, it’s going to make your day so much more brighter. Brome Squirrel Proof Bird Feeders Are Convertable. 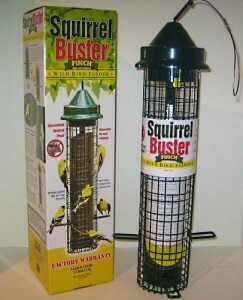 Another plus to the squirrel buster feeders is that some of the models can also be used to feed clinging birds. The perches are removable and hence it is wery easy to converted it into a clingable bird feeder. Many different varieties of wild birds such as the cardinal, finch, redpoll, chickadee and lots of others can be feed using these bird feeders. The Brome Squirrel Buster also looks beautiful and will be a good addition to backyards, gardens, and will keep the birds comming back for more. When should I feed the birds? Birds will need food all year-round, in winter months there is food shortage and food at the bird feeders will go a long way in helping them survive. And research have shown that spring is the time when natural food resources are at the lowest. The summer is again the time when birds nest and raise the little young, and will thank you for the provided seeds. Do metal perches hurt the birds? The birds do not have problems in cold weather as humans do relating to the feet sticking to the metal objects. This is because birds do not have sweat glands on the feet, and cannot harm them self if sitting on power lines, metal roof tops etc. 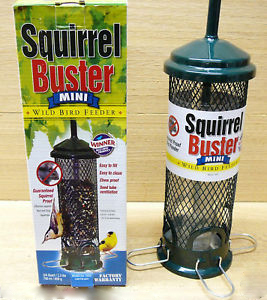 One thing that Squirrel Buster wild bird feeder is not proof from is large animals like bears and raccoons. If you have raccoon problem place your feeder on a place out of reach from these animals. I have provided a list of weight for common backyard birds and squirrels, you can compare them to see the function of the mechanism. The spring mechanism is calibrated at the factory to close at 4.0 oz./ 115 g. The smaller type red squirrels, as well as the larger gray squirrels, are to heavy and are shut out at this setting. This gives good protection to the seed and is great money saver. 1. Black-oil sunflower - This type of food will attracts birds to your feeder like cardinals, titmice, nuthatches, grosbeaks, finches etc. Sunflower seed is a favorite food of many types of birds and if you use it in the Brome Squirrel Buster Classic you will attract the largest flock. 3. Peanuts - You can fill this bird feeder with crushed peanuts , these are popular with woodpeckers, chickadees, titmice, nuthatches, wrens, kinglets, northern mockingbirds, brown thrashers, starlings, jays, and certain warblers. If you use peanuts this is the great bird feeder, whole peanuts can be used in Squirrel buster peanut plus feeder. This Squirrel buster bird feeder is made of metal, and this makes it very sturdy, it will stand the harsh weather like wind, sun, rain and snow. The mounting mechanism is a strand of metal wire rope that is looped at the top and threaded through a plastic connector that comes beneath the cap. It is truly one of the best on the market out there, brome did a good job and this one. This makes it easy to place on a branch or a hanging pole. From all of the bird feeders I have reviewed this one is the top of the line. I have seen squirrels jumping all over it, raccoons knocking it down and it still works. But nothing is bullet proof, bears can and will damage it if you live in bear area. 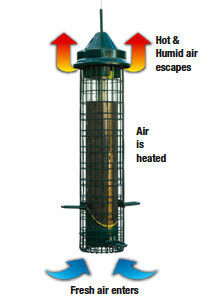 Water will not get inside so much, but it must be checked on regular basis if mold is catching inside the feeder. Also don’t drop the feeder too much, it is made of metal but the closing mechanism can still be broken if it falls over and over. If you secure it good, than you don’t have to worry. If you have other feeders in your yard, place them apart so the birds don’t fight to much over them. This way you give the birds a chance to alternate at feeding. The squirrels will try to get the seed from the feeder, but will give up after some time, so we can say that you can place it even where the squirrels can jump on it if you don’t have the choice. But if you don’t want them to scare the birds place it away from objects that are good spring boards for squirrels to jump. After some time they will stop trying. As the closing mechanism is triggered by weight, the squirrel that can reach the feeder without jumping on it can still get the seed. To prevent this place it at least 18 inches or 47cm away from such objects. Remember if the squirrels must jump on the feeder it cannot get the seed, simple as that. Squirrel Buster Bird Feeders are a little more expensive. But the Classic and Finch feeders goes with free shipping. I have to say that Brome goes a long way to supporting its feeders, it comes with 2-year warranties, and you can replace them at that time period if they don’t perform, and this is one big plus. If you look at it from the point that after losing cheaper feeders to squirrel damage, a quality feeder ultimately saves you money, and you can have more time watching the birds. Thats why this is one of best squirrel proof bird feeder on the market. Check Brome 1015 Squirrel Buster Classic here. Check Brome 1016 Squirrel Buster Finch Feeder here. Check Brome 1055 Squirrel Buster Mini here.